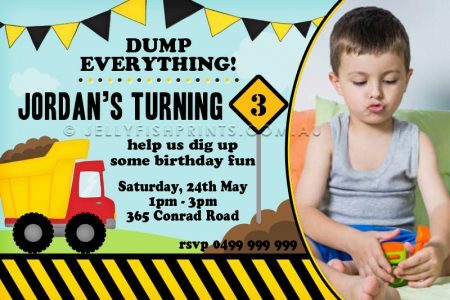 Dump Everything for a Construction birthday party celebration. For boys who love to get out their Dump trucks, tool boxes and Tonka trucks for a bit of fun in the dirt. This printable party invitation design and free thank you card is just right for such a celebration. These fun boy themed construction party invitations can be customised with a photo of your little boy (or girl of course!) It features a dump truck and a sweet party banner hanging across the top of the invite. We’ve blended a lot of black and yellow into this invite design and can change the basic colours to any of your choosing. Some like the orange and black better. The age of your child will be highlighted in the road sign next to the guest of honor’s photograph. There is plenty of space for your party information with room for an extra line or two. You will receive a customised “print it yourself” digital invitation JPEG file. Emailed to you and ready to print at your local photo lab or on your home printer. You will also receive a free Thank You card with the matching theme.